Mac OS X 10.5 and latter. 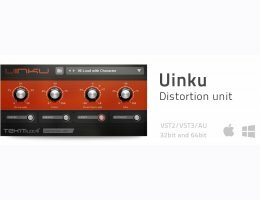 Uinku is a foldback distortion for VST2, VST3 and Audio Unit plug-in formats. The interface features a "Mix" control for blending the original sound with the sound of Uinku and an "Output Gain" control with a clipper stage to drive your distortion even further.